Preheat oven to 350°F. Grease a 3-quart casserole dish with butter. In a 6-quart pot cook elbow macaroni in salted water for the short end of the cook time stated on the package. Drain, and rinse well with cold water. Leave macaroni in colander. Spoon the Cheddar soup into the empty pan. Gradually stir in the evaporated milk. Add the shredded Cheddar cheese, 1 cup jack cheese, 1 Tbsp TSG over-the-edge herbed spinach, pepper, salt and nutmeg. Stir in the cooked elbows. Spoon mixture into baking dish. 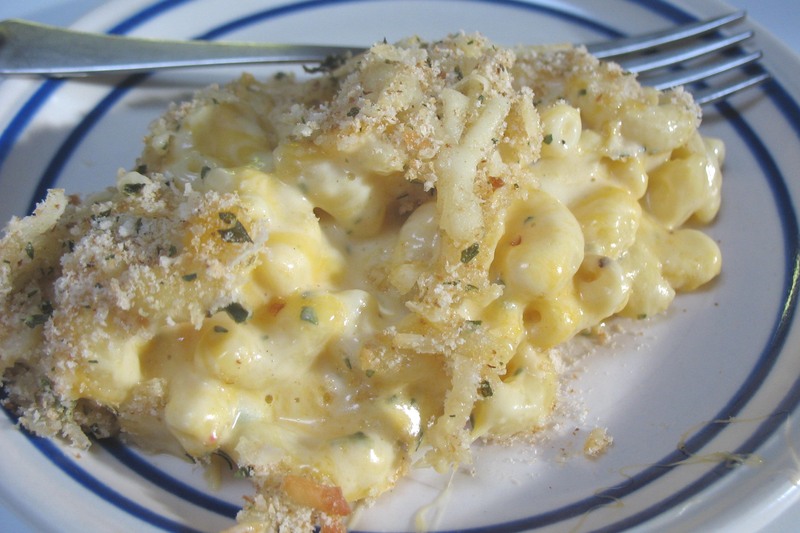 Combine the reserved cup of jack cheese, dry bread crumbs, and the remaining 1 teaspoon herb mixture. Sprinkle evenly over macaroni. Cover and bake 30 minutes. Uncover and bake 15 minutes more or until the top is slightly golden. I purposely use the pasta pot to mix everything. It’s a bit unconventional, but better than washing so many bowls! A generous sprinkle of a good quality Parmesan or Romano cheese in the topping mixture is tasty, but it makes more sense to use just two cheeses that can be purchased in 8 oz bags. Either way, this mac & cheese is delicious. * TSG is Two Sisters Gourmet. Here’s a substitute for over-the-edge herbed spinach: In a small cup, stir together 1 Tbsp dried parsley or chives, 1 tsp dehydrated onion, 1/4 tsp dried dill, and 1/4 tsp garlic powder. Yvonne, You are right, many canned soups are high in sodium. I use it as a time saver and a quick flavor-enhancer. And, I don’t indulge in mac & cheese all that often. But let’s look at the actual sodium: 1 can cheddar cheese soup has about 2225 mg sodium, divided by 6 mac & cheese servings equals 371 mg sodium per serving. That’s not bad. Yet there are other sources of sodium in the recipe — the cheeses for instance. 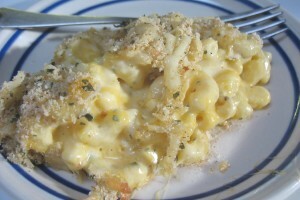 The May 2010 issue of Saveur magazine features macaroni & cheese on the cover. Their recipe uses Velveeta, among other cheeses. Many of our recipes will have nutrient analyses, especially those developed for clients. Sounds great! Am planning on making it tonight! How did it turn out, Maureen? Let me know — the good, bad, and ugly! The mac and cheese turned out very yummy the kids loved it and I loved being able to mix everything in one pot :).